The 2nd time's a charm! Partially Proofed Rolls - they started out 1/2 inch apart. A few extras. These are baked in a 6 1/2" x 10 1/4" sheet. Much nicer results this time – I used a higher percentage of WW pastry flour, less potato & may have developed the dough better. I had a nice windowpane with this one, I don’t remember if I did the last time. The dough seemed too sticky at start of bulk rise, but was very nice to work with when I shaped. Shaping this dough was like night and day compared to my first attempt - the dough was that different. I had planned to make half the dough into a sandwich loaf, but it was so nice to work with I just continued shaping rolls. Now I have 8 in the freezer to pull out and bake. I used a heating pad set on low for the final proof. It took quite awhile - about 3 hours I think. Maybe next time I'll see if I can preheat an oven to about 95F, which is the recommended temp for rising rolls. I tried to follow Laurel's insruction to let them just barely overproof, i.e. just start to sag a bit. But I was too impatient. They hadn't quite reached that stage, though I think they were close. Mix the soaker and biga separately. Cover and refrigerate overnight. The next morning, let doughs sit on counter for 2 hours to warm up. Flour work surface using some of the extra flour. Spread soaker and biga into similarly sized rectangles, and generously flour the tops of both. Place one rectangle of dough on top of the other, and chop the stacked dough into about 20 pieces. Place in mixing bowl. Hold back about ½ cup of flour. Add all other final dough ingredients to bowl. Mix with paddle attachment until thoroughly mixed. Allow dough to rest for about 20 minutes. Switch to dough hook for kneading. Add remaining flour in small increments if required (I used it, not sure afterwards that I needed to.) Knead with stand mixer until you develop a nice windowpane. The time will depend on your machine. The dough will be very sticky. Place dough ball in a well-buttered bowl, turning over to coat top. Cover and let rise in a warm room for about 2 hours – until your wet finger makes a hole that does not fill in. Turn dough onto a lightly floured kneading surface and deflate. Divide dough into four equal sections and form each one into a ball. Keep these covered with a damp cloth or plastic wrap. Let the dough rest until the first ball is relaxed, soft and pliable. Gently flatten the dough and cut into 6 pieces. Form one round roll out of each piece, keeping the smooth surface intact. Place the finished rolls on a buttered cookie sheet or cake pan, keeping them ½ inch apart. This recipe should about fill 2 9x13 pans. 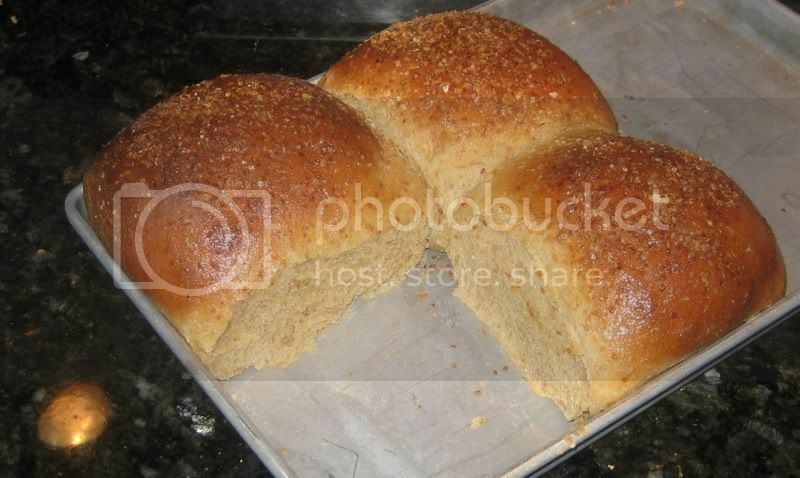 Cover the rolls and allow to rise in a very warm place (95F) until slightly overproofed, i.e. rolls show slight signs of sagging. Don’t let them dry out. When rolls are ready to bake, spray generously with water or brush with eggwash. Sprinkle wheat germ on top. Bake in a preheated 400F oven with steam for about 20 minutes (check sooner), just until they are beautifully brown. Remove from oven and brush with melted butter. If not serving immediately, remove from pan to cool on rack. I froze some of the shaped rolls for later use. - Increase yeast in final dough to 2¾ teaspoons. - Make the soaker with all whole wheat pastry flour. - Increase butter to 5 or 6 tablespoons. - Include a 2nd bulk rise before shaping. Ideally this would be at a temp of around 80F. 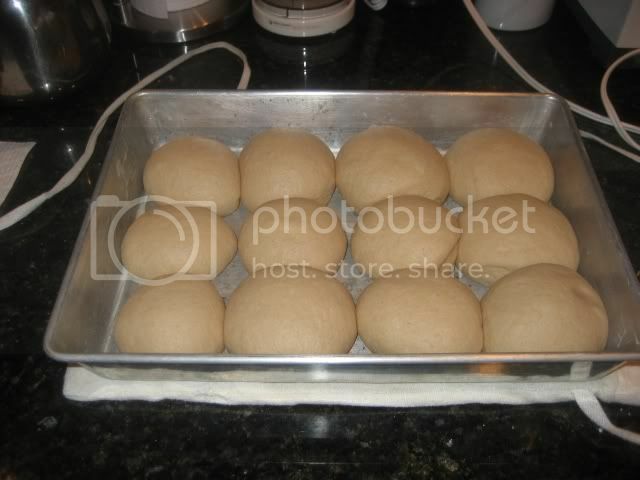 - Make slightly smaller rolls – form each quarter of dough into 8 or even 10 rolls. These might not fit quite as evenly in a 9 x 13” pan but would be a better size. Those are really beautiful! Much better than my attempt at similiar rolls, LOL. I had thought I had read you could use whole wheat pastry flour for a lighter roll but wasn't sure if my memory was correct so I didn't use it in mine. Would love to try your recipe if you want to share. : ) They look heavenly! Kippercat, very pretty. It looks as if that would make a really nice loaf, too. I'd like to see the recipe as well. Okie and Browndog, I added the recipe to the original post. I hope the directions are clear. I know what I did, so of course they're clear to me! My last stop for the night, thanks, KipperCat. It sounds as good as it looks, and I intend to go ahead and make a pan loaf out of it next bake day. I think I better sub regular whole wheat for the pastry flour, though. Thank you thank you! Oh, darn my scale has died and I haven't got a new one yet. Guess I will have to move it up on my list, LOL. 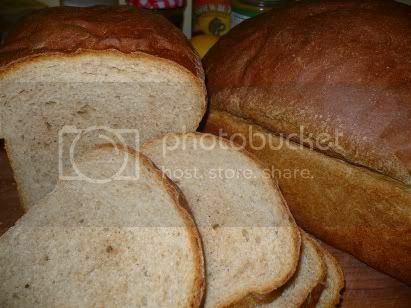 I can't wait to make this bread! Please let me know how it turns out for you, and if you try any of the changes I listed at the end - or any of your own! Ok, so I went out and got a kitchen scale today and some white ww flour and started the biga and the soaker. All was going well until I realized I have active dry yeast NOT INSTANT. I ordered some but it hasn't come yet. I quickly did a search and it someone suggested adding 121% of active dry yeast for instant. So the recipe called for .5 tsp so when I multipy that times 1.21 I get .6 tsp. Since I have no way of measuring that... (I guess I could have weighed .5 tsp but didn't) I just added a heaping .5 tsp of yeast. BUT then I realized I probably should proof it in a little bit of water so I used probably an extra 1/4 cup of water to do this. So...tomorrow we shall see how it turns out. How much should I mix the soaker by the way? And why do you let the rolls slightly overproof right before baking? Just wondering...I thought over proofing was to be avoided. The next time you need to convert for active dry yeast, just use some of the water from the recipe for the proofing stage. That way you won't have to add extra flour to make up for the extra water. It shouldn't be a problem, just easier if you don't have to do it. As for the biga, you just need a small amount of yeast to act on the flour, it doesn't need to be a precise amount. What made these turn out for me was that I FINALLY developed the gluten enough. After one disastrous overkneading episode, I had been real hesitant to keep kneading. I think I've got past that problem. I'm sure your rolls or bread will be delicious! Yeah, I realized after I dumped all the water in I didn't have the instant yeast, LOL. Kippercat, this is a keeper. The process itself was interesting and fun, and the bread is fall-over tender--when I cut it I was trying to remember if I 'd snuck some white flour in there, but I hadn't. I did like Amy and left the biga out, but after only an hour and a half it was almost ready and I wasn't so in the fridge for several more hours. I baked it cold-start, set the oven at 400*, left it for 10 minutes then reduced the heat to 350* for another 45 minutes. While it baked I kept smelling roasted potatoes. The aroma when I cut it was wonderful, sweet and tangy. Your subject heading "Kippercat's whole wheat" really took me back. Kip really liked bread, not to eat, but to play with. He ignored commercial bread, but if we left a loaf of bakery bread out on the counter, there was no telling where we'd find it. It might be under the sofa, in the coat closet or laundry room. But wherever it turned up, the bag was covered in teeth marks. It had been tossed and kicked until the shape of the bread inside bore little resemblance to a loaf of bread! 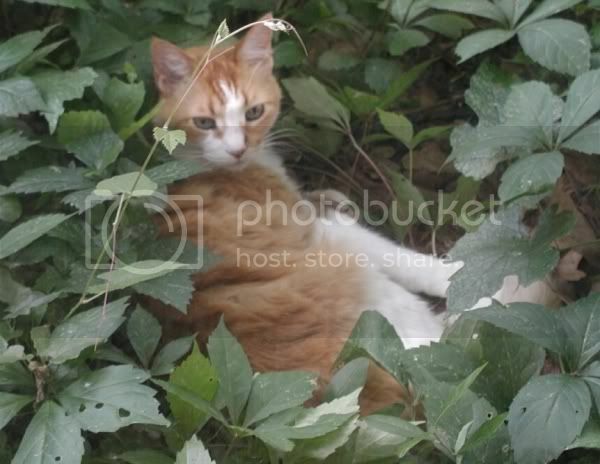 KipperCat was a wonderful guy. We still miss him, but are very blessed that he shared our life for so many years. What a punkin--and thanks for sharing that beautiful picture! I want to just scoop him up and give him a scritch under that little white chin. Do you know, even when I see your screen name, I think of the kitty it belonged to, and how nice it is that he was loved. It's hilarious that he was a bread thief with discerning taste. I came home from work today to find the remaining third of the first loaf, which I had left pretty far back on the counter, was missing. When my dogs steal things, they usually don't leave evidence. Thank goodness the other loaf was in the cupboard. I believe the potato made the soaker drier, at least the way I did it, which was to combine potato and water to count as the 345 grams of liquid and flakes from the original recipe...it was rather a stiff soaker and I probably should have added more water. I imagine that's why I didn't have to add any flour at all to the final dough. Anyway, thanks for sharing Kipper and the great recipe. I'll be making this one often. 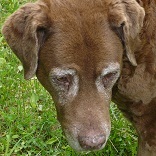 Browndog, did you have any more dough besides the two loaves? I'm finally ready to bake again, and thought I'd make a nice soft loaf for DH before my wild side takes over again. Hi, KipperCat. I've made this bread several times by now, each time a little different. With the bread pictured I had just enough dough for the two loaves. Next time I had enough dough left over to make a half dozen rolls, but that time I used some of the extra flour. But usually I make two good-sized loaves without any leftover. Sorry to be so fuzzy! Fuzzy baking - hey, that's the way I usually do it! Thanks Browndog, I sort of figured it at about more than 2, but less than 3 loaves. Since you got 2 good loaves, I won't try any changes the first time I make it as a loaves - except for not using the pastry flour. KipperCat, last night I was three-quarters asleep. Hopefully I'm thinking a little sharper this morning. I believe the variation I get with flour and dough amounts has to do with the fact that I use a regular potato along with its cooking water. Because I don't know what a precise substitution would be, that certainly affects how much flour I need to add to the final dough. I got those half dozen rolls when I added the extra flour called for in the recipe. When I don't add any or not much, the dough maked two hearty loaves. You poor dear. That bus ride must have been a nightmare. I hope you hit him with your purse. About the biga, I did refrigerate overnight and then when it said to take it out and let it warm up for 2 hours, I let it warm up for 4 because I wasn't home, LOL. Do you mean you didn't refrigerate yours at all? And when you say you baked it cold start, what does that mean? You didn't let it completely rise before it putting it in the oven and counted on oven spring? I noticed when I toasted the bread, the wonderful smell of the honey in the recipe. I will have to try the potato/water next time. I really would love to add stuff like sunflower seeds, oats, or brown rice or something. How would I do that? Just add it all in before I shape the loaf for the final rise? Well, you could do that, but you could also add whatever you wanted to the soaker, and it would probably give you better control over the hydration of your final dough. What do you say, Kippercat? With my limited experience on additions, I think you're right that they'd be better added to the soaker. You'd probably want some more water for the oats (maybe 1 to 2 times the volume of oats?) Maybe the brown rice should be cooked before adding. It's not something I've used. I have used cornmeal and grits in hearth/artisan breads. To my surprise, I preferred the taste of the grits. The corn taste came through better, I guess because it's a coarser grind. Though with such a soft bread as this they might stick out more. Amy, go ahead and try it & let us know, OK? I must say these are very good. I had a bag of home ground white WW flour that I received from my friend "Susan from San Diego". This is the first time I have used freshly ground flour and the flavor is incredible. I was whining about how my ww flour didn't have a very good flavor so bless her heart she ground some with my name on it. I used the 1/2 stick of butter and did 2 bulk ferments as suggested. I think maybe I over fermented the dough by a little since I didn't get a huge rise after shaping and not much oven spring. I did get a great rise for both primary and secondary ferments and I used SAF-Gold since this is an acidic "sour" dough. 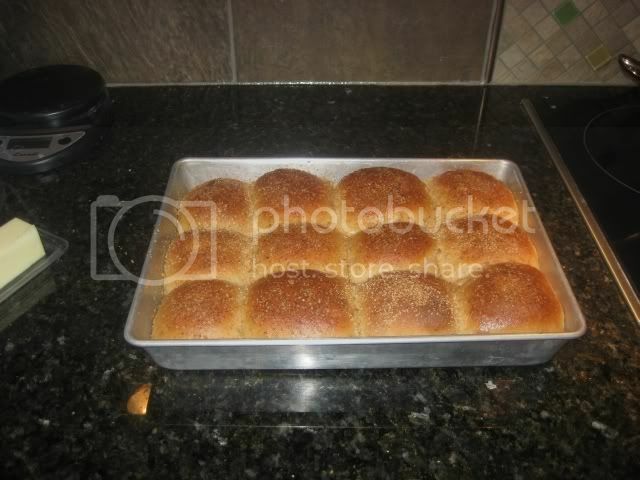 I made one 9X13 pan of rolls and 2 small panned loaves. I think next time I will combine the 2 pan doughs for one larger loaf. Very nice recipe KipperCat, thanks! Eric, they look great! I'm glad they worked out so well for you. There must be something going around about underestimating pan capacity. I did the same thing the other day and ended up with three little sourdough loaves instead of 2 good sized ones. ps I really envy you & Susan and all the others the fresh ground flour. There really is nothing like it for flavor.